Cooler weather is already here—and winter is just around the corner. 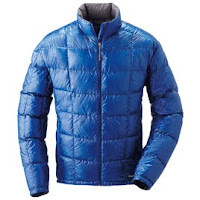 In preparation for the upcoming chill, I have been keeping my eye out for the perfect ultralight down jacket. Warm enough to work well as a stand-alone piece in cool weather. Form-fitting enough to function as a layering piece in colder conditions. Small enough to squash to grapefruit size for in-your-pack-warmth when you need it. Hard to top this one. 12 ounces. Recycled polyester shell fabric. 800-fill down. Stuffs into its own internal pocket. Great fit. $200. 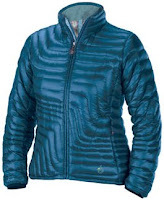 They also make a women's version, which gets rave reviews from several of the serious outdoorswomen I know—especially for its quilting pattern, which seems to really keep the down in place. For an extra 3 ounces and $50, both men's and women's also come in a hooded version. Marmot Zeus This is a contender in part due to its lower price point ($160), but primarily because it is cut 4+ inches longer—ideal for tall (6'5") guys like myself. What's more, Marmot also tends to cut their arms longer than other brands, another huge plus for lanky guys. (Though it does increase the weight to 14 ounces). 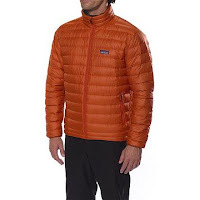 Similar to Patagonia otherwise: 800-fill, internal stuff pocket. 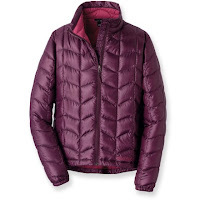 The women's version of this jacket is called the Venus (pictured right). Hooded versions for both are available. Isis Slipstream Jacket My female colleagues insisted I at least mention the Isis line of down jackets, which evidently are very well cut and quilted. The Slipstream is their most technical piece ($229).